Studying abroad opened my eyes to the multitude of opportunities and scholarships available on campus in my quest to help fund my trips. It also helped me see how diverse our own community is. Of course it also played an integral role in helping me complete all 4 parts of the RISE Challenge. 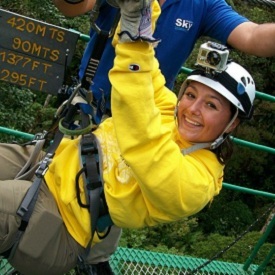 My best memory from my time abroad would probably have to be zip lining in the Costa Rican cloud forest, high above the tree canopies. I also really loved all the history and beautiful architecture I was able to experience in Spain [another study abroad program], but man is no match for the perfect designs of Mother Nature in Costa Rica. If study abroad is something you are even remotely interested in DEFINITELY check it out, the sooner the better! I loved both of my study abroad programs. Costa Rica was service-oriented and the other [Salamanca, Spain] was a language immersion. Each allowed me to learn about local cultures and customs and feel a real connection with the country I was visiting. I most definitely plan to go abroad again. In fact, ever since my first study abroad trip in 2012 I have made it a point to travel internationally at least once a year and plan to do so for the rest of my life. I gained valuable language skills, as well as strong friendships and memories that will last a lifetime. If study abroad is something you are even remotely interested in DEFINITELY check it out, the sooner the better. At IUPUI we have access to so many programs there truly is something for everybody. That is not even mentioning the multitude of scholarships available through the Study Abroad Office, various schools, and the Honors College. Your advisers will work with you to ensure your trip does not delay graduation or cost you outlandish sums of money. The experiences you have while abroad will truly change your life.